"Mightiest Of Men... Mightiest Of Spectacles... Mightiest Of Motion Pictures!" The Vikings is a classic Hollywood story of the legendary Viking leader Ragnar and his two feuding sons. 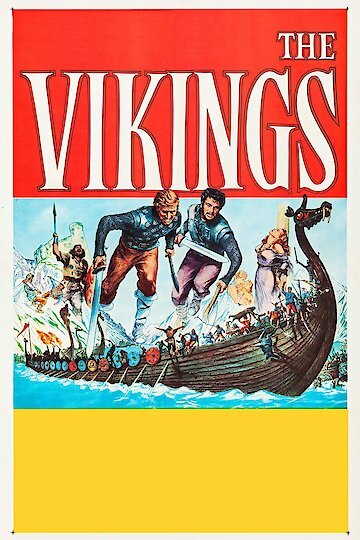 Starring 1950s icons, Kirk Douglas and Tony Curtis, the movie opens with the sacking of the northeast of England by Ragnar and his Viking men, which ends with the Queen of Northumbria pregnant by Ragnar, who unknowingly takes the baby hostage and turns him into a slave. The baby grows into a young man known as Erik, who is quickly recognized by a Northumbrian nobleman taken hostage in Norway by the aging Ragnar. Erik and Ragnar's other son, Einar fight before the parentage of Erik is uncovered by Lord Egbert who claims him as his slave. Einar and Erik both fall in love with the captured Princess Morgana, who is rescued by Erik, who flees with her back to England. The pair and their ship are followed by Einar, who is determined to kill Erik and claim Morgana as his bride. The Vikings is currently available to watch and stream, download, buy on demand at Amazon Prime, Amazon, iTunes online.